This colorful, graphically rich chart illustrates and summarizes theories of gravity as they evolved from Newton's Law of Gravitation to Einstein's General Theory of Relativity. Developed by scientists at Sonoma State University who are members of the LIGO (Laser Interferometer Gravitational Wave Observatory) Scientific Collaboration, side panels in the chart also include information about ""classical"" black holes and the indirect evidence for the emission of gravitational waves which resulted in the Nobel Prize in 1993 to Hulse and Taylor. 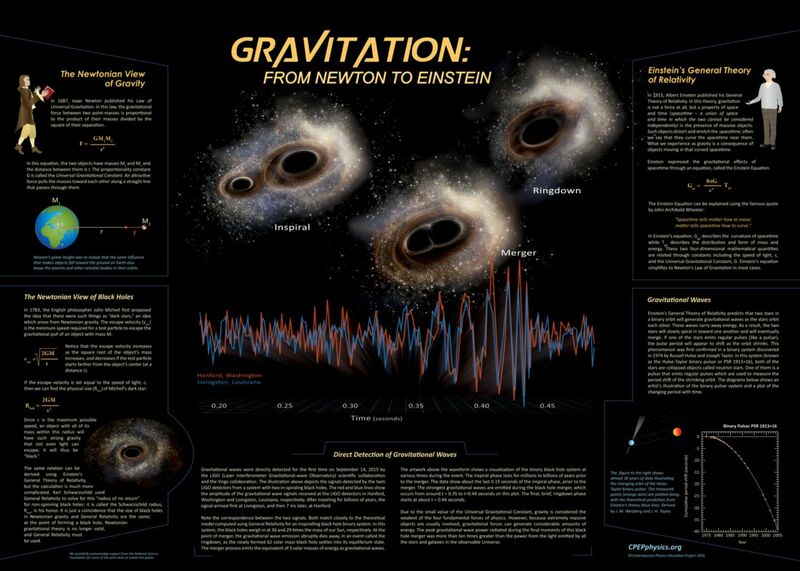 The centerpiece of the chart is an artist's illustration of merging black holes which produced the first direct detection of gravitational waves in September 2015. Part of the Contemporary Physics Education Project (CPEP) series, see the charts on Fundamental Particles and Interactions, Nuclear Physics, Fusion and Plasma Physics, and the History and Fate of the Universe in this catalog. Free materials for educators which supplement this chart are available at http://cpepphysics.org/gravitation.html.